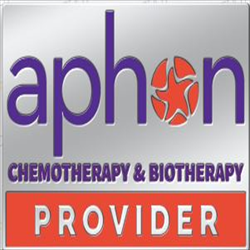 For more information on APHON's Pediatric Chemotherapy and Biotherapy Program, please visit the APHON Website. Introduction and Standards begins with an explanation of the curriculum and courses and provides standards for practice and education. General Cancer Overview provides a historical perspective on cancer, cancer cell characteristics, hematopoiesis and immune response, diagnosis, cytogenetics and staging, modalities of therapy, measuring tumor response, and pediatric versus adult cancers. 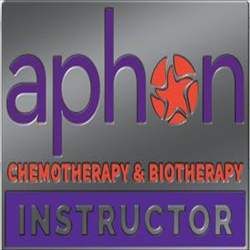 Chemotherapy Overview reviews cancer research and phamacokinetics and pharmacogenetics. Principles of Chemotherapy reviews the goals of chemotherapy in the treatment of cancer to kill malignant cells and prevent them from metastasizing in order to better understand how chemotherapy works. 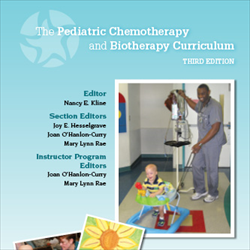 Principles of Biotherapy provides an overview of classes of chemotherapeutic agents, combination chemotherapy, the role of chemotherapy in childhood cancer, and modes of chemotherapy delivery. Chemotherapy: Agents and Classifications explains classification of chemotherapeutic agents: alkylating agents, antimetabolites, antitumor antibiotics, anthracyclines, plant derivatives, corticosteroids, and antiangiogenic agents. Safe Handling of Chemotherapeutic Agents reviews occupational exposure risks, exposure prevention, labeling and storing, administration, disposal, spills, and handling agents in the home. Administration Considerations discusses pre-administration considerations, chemotherapy administration, and immediate postadministration issues. Toxicity and Symptom Management provides an overview of all the systems in the body that can be affected by chemotherapy, including: the nervous, gastrointestinal, immune, integumentary, and renal systems. Late Effects of Chemotherapy addresses the long-term, often chronic, effects of cancer and its treatment. Psychosocial Issues provides insight on the quality of life factor for patients and their families, including adolescents and young adults. Ethical and Legal Considerations explains the foundation of ethical principles, regulatory groups, informed consent, legal issues, medication errors, and confidentiality. 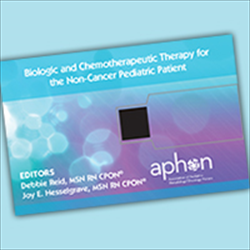 APHON members save $15.00 USD or more! Eagerly awaiting the new addition. Much of the information remains relevant, but there have been numerous new developments since its' publication in 2011. When teaching the Provider class students find it necessary to "jump around" to find the information being presented. Was truly hoping the new book would have been available for our late fall class.